Startup funding incubators can make or break its chances of success. With the right incubator, today’s startup founders get a jumpstart on the path toward growth and success in the critical early development phase. Business incubators help startups navigate to each next step of development by providing access to experienced business mentors, contacts, resources, and vital investor capital. Incubators are particularly beneficial for first-time founders who can gain a wealth of knowledge from experienced professionals about testing business models and avoiding common pitfalls. A reputable incubator can also provide industry credibility by association. Founders also benefit from networking with other startups in the incubator’s network. Finding early-stage funding is essential for providing startups with the ability to test business models and develop products. Incubator-based startups don’t have the budgetary resources to cover the everyday expenses such as rent, overhead, equipment, marketing guidance, and more. The very nature of incubators offers founders opportunities for possibly sharing resources and innovative perspectives with other startups in order to maximize their funding budgets. The ability to meet with interested investors can make or break a startup’s chance to get their business off the ground. Raising capital involves searching for and making appointments to meet with viable investors whose time and attention is in high demand among a sea of startups competing for seed money. The process can be long, expensive, and exhausting without the help of a successful incubator with connections to investor networks that are best suited to the startup’s particular business concept. 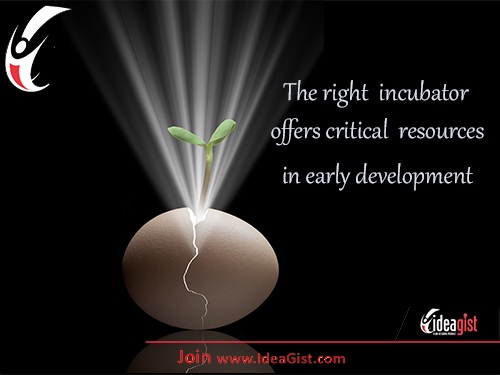 The right incubator can also help founders develop a winning pitch to improve their chances of securing the capital they need. A successful incubator enlists experienced and proven entrepreneurs to provide mentorship in the basics of successful startup business practices such as developing and crafting a business plan that appeals to and is ready for investors. An incubator can provide an ideal environment for practicing and honing your pitch ao you’re ready to deliver it for maximum investor interest and receptiveness. IdeaGist prioritizes relationship-building with investors around the world to help innovators whose great ideas may never see the light of day without the capital necessary to get through early-stage development. Learn how to maximize your startup’s potential. IdeaGist’s digital incubator can help you open doors to infinite possibilities. Find out what makes IdeaGist the largest digital incubator on the planet!